The crochet shell stitch is an advanced beginner crochet stitch that adds decorative appeal to projects. It makes a great border, or you can work it in rows. Crochet the shell stitch in a single color to create a beautiful texture or change colors from row to row for a more intricate design. There are many shell stitch variations, such as v-stitch crochet shell, as well as different ways to incorporate shell stitches into your projects. This version uses four colors, but if you'd rather work yours all in one color, skip the color changes. Of course, you can also use fewer or more than four colors. Ready to learn how to crochet shell stitch? Grab a hook in a size that matches your yarn weight and get started! Using your first color of yarn, work a starting or foundation chain. The starting chain should have of a series of chain stitches in a multiple of six stitches plus one. For example, when making a swatch, use a starting chain of 31 (five multiples of six plus one extra stitch). 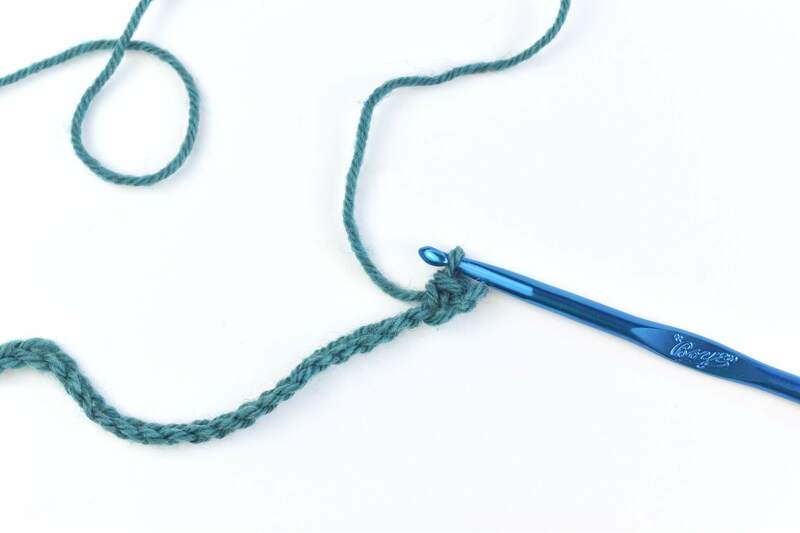 Work a single crochet stitch into the second chain stitch from your hook. Skip the next two chain stitches, then work a double crochet stitch into the next chain stitch after that. Work four more double crochet stitches into the same chain stitch, for a total of five double crochets. This set of five double crochet stitches creates the shell. Skip the next two chain stitches. Then work a single crochet stitch into the next chain stitch after the unworked chains. Now you have your first completed crochet shell, anchored on each side. Repeat until the end of the row, ending with a single crochet in the final stitch. 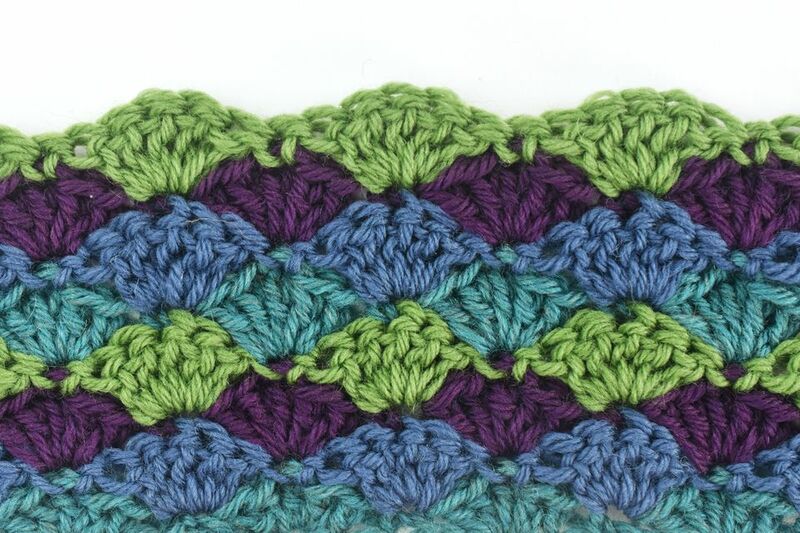 A single row of crochet shells like this makes a great trim. You can add it to the border of any crochet project. You can also attach it to fabric, such as tablecloths, napkins, or even quilts, by sewing it on. If you want to continue working in the same color, without doing any color changes, complete the single crochet stitch, but do not end off. Skip the color change instructions and then pick up when you get to the turning chain instructions. If you're working rows of shell stitch using more than one color, work the last single crochet stitch without completing the last step of the stitch. Attach your new yarn color and complete the stitch. Work a turning chain of three chain stitches. This counts as your first double crochet stitch in the new row. When working in more color, you may want to weave in the ends as you go. Cut the first color and weave in the end at this point, along with the end generated at the beginning of the work. Another option is to crochet over the ends to secure them. Turn your work around and work 2 double crochet stitches into the first stitch. If you count your turning chain as a double crochet stitch, this gives you a total of 3 stitches at the beginning of the row. Skip the next 2 stitches, and work a single crochet stitch into the next double crochet. You should work into the center stitch in the grouping of shell stitches in the row below. Skip the next 2 stitches. Work a group of five double crochets (another shell) into the next stitch. Skip the next 2 stitches. Work a single crochet stitch into the middle of the next shell. Skip the next 2 stitches. Work a group of 5 double crochet stitches into the next stitch. When you reach the end of the row, work 3 double crochet stitches into the last single crochet, forming another half shell. Change to your next color of yarn and chain one for the turning chain. Work a single crochet stitch into the first stitch. At the end of the row, work your last single crochet stitch into the turning chain. Repeat rows 2 and 3 for your pattern repeat until you reach the desired length for your crochet shell stitch project. If you're also working in a color pattern, remember to keep your color pattern consistent as well.